Thank you for the package that I received in the post. It was addressed to SSGT ******** but he has now returned home. I got it instead. It was a nice surprise and a very welcome when you have a lack of home comforts the little surprises make all the difference. I know you weren’t expecting a reply but I feel it’s the right thing to do. The army teaches what’s called ‘core values’ and respect for others is one of them. Your package has reached Oman in the middle east and is getting put to good use. the Irn Bru especially as it’s nowhere to be found here. I see you’re from Stirlingshire which is where my mother is from, a village called Kippen, but I’m afraid I’m English! I am writing this letter to thank you for the goodie box. I actually gave your one away as I had two. But you do such a wonderful deed I thought you deserved thanking twice. Your boxes are a wonderful surprise and it is warming knowing the folks back home are thinking of us here in Afghanistan. I think what you and the rest of the team do at SOS is truly admirable and on behalf of the rest of the armed forces I applaud you all. Thank you for the wonderful gifts that we received, it was very thoughtful and will be greatly enjoyed over Christmas. Happy belated Christmas and new year. Just a quick note to thank you, on behalf of all the United Kingdom Training Team in Camp Taqi, for all your efforts to send out the Christmas boxes to everyone here. For some of us this is yet another tour away over the festive period, for many this is their first operational tour, made more challenging by being sway over Christmas. We are a bit of a motley crew out here with engineers from the north of England, Infantry from Edinburgh and medics from all over – but every lad and lassie were greatly appreciative for a small reminder from home. It is an important job they are doing out here, and not one that is widely known about back home, so a little bit of morale does wonders for them. On behalf of everyone out here, again our thanks. Many thanks! I have received the package and my word it is amazing. A lot of unexpected treats but welcome non the less and I am profusely grateful for the time and effort spent on bringing a big smile to my face. our office to make sure no one missed out). can stay in touch with them most days. morale boosting welfare packages to brighten our days. Thank you for the Easter parcel it was very much appreciated. The Easter cards are displayed in the office. I will be replaced at the end of **** by Sgt **** if you can send a parcel to him it will be very much appreciated. I get back to blighty in **** so hot weather here then hot weather in London. I am back in Scotland in **** hopefully the weather is kind to me. I would like to thank you very much for the kind parcels which you sent out to me. I have passed them on to the CP teams as they are a group of lads and lasses who are often out on the ground and don’t always get to enjoy the relative ‘comforts’ of being able to grab a cup of tea or just sit for 5 minutes without having to be on constant look out. So, I hope you don’t mind but I have passed the parcels on to them. I would also like to say thank you for the lovely Easter cards from Kieran and Michael, they have been put up in our little brew area. A lovely bit of colour to brighten up the ‘little UK enclave’ here at Head Quarters Resolute Support. I hope you have all had a lovely Easter and that the weather has started improving. The weather reports we have seen over here suggest you have had snow and that for the end of March and April it has been cold! The weather here has started to improve, more days of sun, with the odd thunder storm, but on the whole it has been quite pleasant. Anyway, thank you once again for your kind gifts, I am likely to leave theatre in the next month, but your support is gratefully appreciated. I am writing to express my profound gratitude for the parcel you sent. It is such a privilege to have the support of yourself and SOS which contributes in bringing morale to the troops out in theatre. (operational) Please carry on with the sterling support you provide and I will forever be indebted to your kindness and efforts toward the troops. Lexie & Denny Primary School the messages on the Easter cards were lovely and brought a tear to my eyes. Thank you so much for the Christmas parcel that you send via Maj ******. You will probably guess from the date of this letter that I have a confession to make! One of the boys who lives in my block literally couldn’t help himself and opened his box yesterday. He is Scottish so he was excited to see where the parcel was from. He’s mad for the Irn Bru so he was not disappointed! Obviously we can’t get it out here so I will be donating mine to him too. Anyway, he told me I should open mine because there were Christmas decorations inside and I’m afraid I caved! It was a strange coincidence that when I opened it, an officer who has just started to wear glasses came in and claimed the lens cleaner so he is very happy. I was lucky enough to receive a parcel from you and Denny Primary School this Christmas and wanted to write and tell you how grateful I was and how much it meant to me. I am a squadron Leader serving in the Royal Air Force in Minhad in the United Arab Emirates. I deployed shortly before Christmas so did not get a chance to spend it with my wife and 12 year old son. The parcel was fantastic and full of some fantastic presents which really cheered me up. However, what was best was the Christmas cards which now have pride of place on my desk at work. I had ones with messages from Anthony, Megan, Will and Liam and the pictures and colouring in was really good! I have spent quite a bit of my RAF career serving in Scotland (The Shetland Isles, Buchan, Aberdeen and St Andrews) so when I saw the bottle of Irn Bru it really reminded me of happy memories in Scotland. Christmas in Minhad was very different from back at home in the UK. When I left there was snow on the ground but it is very hot here and instead of snow we have lots of sand! However, we had a Christmas tree with lights and had a traditional Christmas dinner. I hope you and all the children at Denny Primary School had a fantastic Christmas and I wish you all the very best for the new year. I will be serving in the middle east until June so will be back in time for the summer holidays. Thank you for organised the distribution of the parcels from your school. I received 4 on the 23rd December. I passed them round the team and we opened them on Christmas day! It was a really nice touch and made me feel that the UK is there in support. Once again thanks for the effort and support from yourself and school. Thank you very much for all your lovely gifts which will definitely be enjoyed over the next few weeks. It is so funny as some of the things you send me, I’ve not seen for years! So reminded me of when my own children were at school. I hope you all had a great Christmas and New Year and were able to spend a lot of time with your family and friends. Finally thank you for thinking about us, it was very kind of you. I wish you all an exciting year ahead. Good morning Emma, Aimee, Sam, Devon, Jayden and the rest of P4D Thank you for the paintings, Merry Christmas and Happy New Year! Your paintings are currently pinned up in my office and have definitely brightened up the office space. Christmas had been a quiet period which has allowed me to speak with family and friends back in the UK. I hope you are all enjoying school and paying lots of attention to the teachers. I only have 4 months left until I return home! Firstly I would like to say Merry Christmas as it is Christmas morning I have had your parcels sitting here for about a week now and I can finally open them. I have been like a big kid waiting to open them. I am really grateful for all the pictures, sweets and other stuff you have sent out to me, you may not think it but it is most appreciated especially on this day as I can’t be with my family. So, from the bottom of my heart thank you to yourself and all the children that made me a picture, I have stuck them up on the wall in my room for everyone to see them. A massive thank you for the parcels! They are definitely a morale boost with all the sugary treats! I didn’t even know you could get Irn Bru in such small bottles! The other nationalities that we work with have never seen it before, so we’re educating them on the UK! Your parcels make post day all the better, thank you for taking the time to send them all. Thanks for your lovely parcels that you have been sending to me. Your parcels have been great and have really lifted my morale whilst on tour. Myself and my colleagues have been blown away by the generosity and thoughtfulness that yourself and others have shown in putting together our gifts. I don’t know if you know anything about where we are. We are in Iraq supporting the operation to liberate Iraq from Isis it’s been a busy tour with a lot of things happening wo getting parcels and gifts really does make a difference. Thank you very much for the parcel and all the sweets they will go down very well when we go out on the ground as there’s not a lot of shops around here ha ha But from one Scot to another Scot thank you so much for the Irn Bru that will get me through at least for a few weeks, a gulp a day! I am Flying Officer ***** RAF, currently stationed at 303 Signals Unit, part of905 Expeditionary Air Wing in the Falkland Islands. I am writing to you to thank you for your generosity in sending my section and I the care packages through ‘Support Our Soldiers’. I wanted to give you a little bit of a background to who we are and what we do here. Our units primarily directive is to provide 24/7 surveillance of the airspace out to 250 miles for early warning of any potentially hostile aircraft approaching the islands, in order to give typhoon fighter squadrons and surface to air missile units enough time to react if necessary. We also provide tactical direction to aircraft to ensure a safe and efficient intercept of the target. As secondary roles, we provide tactical training to the flying units, operate 3 ground based radars, provide civilian air traffic services and co-ordinate search and rescue operations for any person, ship or aircraft in our operational area. It can take 2-4 weeks for us to receive deliveries down here, and the flights often delay or cancel due to the high winds the Falklands are famous for. So it is always a big moral boost to receive packages like yours. The sweets have kept the night shifts smiling and the decorations will ensure we have the most festive operations room in the South Atlantic. It really does mean a lot to everyone down here to know strangers are thinking of us and are kind enough to support us, so once again I’d like to thank you on behalf of 303 Signals Unit for your generosity and support. I really wanted to just quickly jot down a note of thanks to you and your team for my recent Halloween themed box. It was a real surprise to see all the ‘trick or treat’ sweets, the banners and head piece! The detachment is going to hold a Halloween party at the end of the month and all the items you kindly gifted means I can go and share them with everyone else. Please keep up the hard work, your boxes are always well received and do genuinely pick up the morale of everyone who is away from home and loved ones. Wishing you all health & happiness. Thank you so much for my SOS box!! What a lovely idea to fill it full of Halloween stuff!! I love Halloween and can’t wait to decorate the office with all the lovely things you have sent over. These boxes really brighten up our time over here and we are extremely grateful, I have dished out all the sweets with the lads I work with who are all very greatful of how kind you are. Firstly let me introduce myself; I am Sgt **** and I am currently serving in the RAF in the Middle East. I have just been the recipient of one of the SOS parcels that you so kindly organise and send and I wanted to say on behalf of all of my section, who also regularly receive them, a massive THANKYOU!! There really aren’t enough words in the world to describe what you so brilliantly put together and send to us. It is really a lovely thought that you would spend what I imagine is a lot of your own time and hard work to send so may delish treats that provide wo much morale. I have just received a Halloween themed parcel which has brought so much joy, mainly because we have a ‘Victor Meldrew’ character who we work with who hates decorations so we have plastered his desk with the balloons and hung pumpkins on his ceiling. Needless to say he was not impressed! (We loved it!) Also we have a fellow native of Scotland out here, who loves the regular additions of Irn Bru, I think it is actually making his hair turn ginger. Please accept this letter as a small token of gratitude for all that you do for us, it really does brighten our days especially when being away from home for so long. My name is corporal Kev ****** I am currently away on operational deployment in Iraq. Due to my mother being ill and this being my seventh operational tour, I will not receive many if any parcels. So, as the others had 6 or 7, I was presented with one that you have kindly taken the time and effort to put together and send. I thank you sincerely for your kind gifts they are both thoughtful and welcome. It is so nice of you to put them together so that myself and others may have something to open and perhaps look forward too. I am interested as to why you started doing the parcels and also how long you have been doing it for. I hope that others have taken the time to send you thanks and to let you know your efforts have not gone unnoticed or unappreciated. Look forward to perhaps hearing back from you or receiving another parcel later on in the tour. Just a quick message to say thank you for the welfare package you have sent to us. 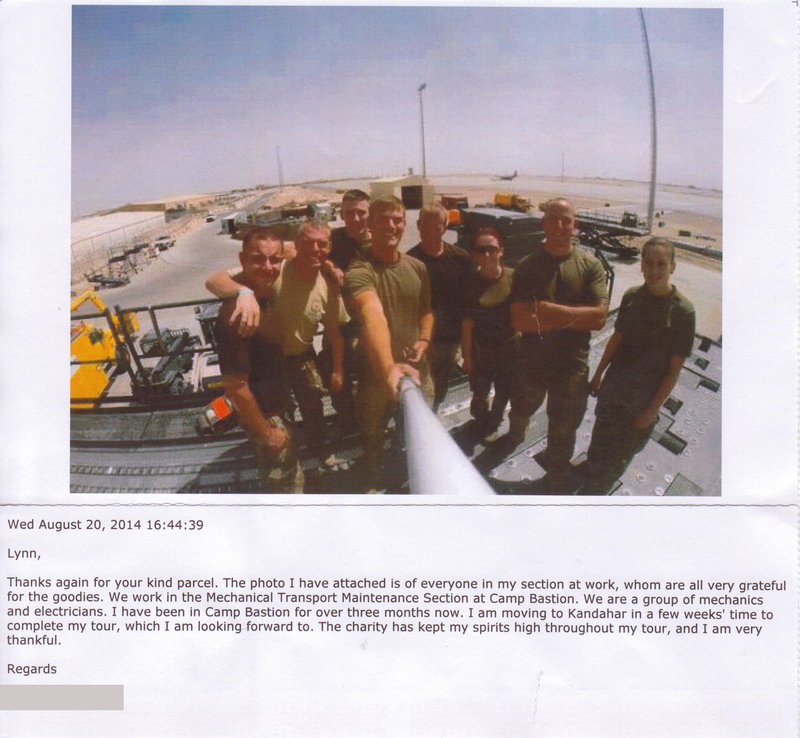 Selfless people like yourself really help to lift morale while we are away from home. We have shared your parcel around our section and it has definitely put a smile on everyone’s faces! My favourite were the frazzles and chipsticks! I used to have these all the time at home. The boys said thank you for the Scottish tablet, they had never tried it before. It will definitely keep us awake on night shift! I’m sure it won’t take long for us all to eat everything. I would just like to thank you for the SOS box you sent out, I really appreciate your support. It really makes my job much more rewarding, knowing people back home support what we are doing (and am Scottish). I’m from the opposite side from you, I come from Ayrshire, born and bread in a town called Irvine. Most famous for producing an awesome soldier called Jimmy ***** “lol” kidding on, may of heard of the Magnum Leisure Centre. So out here, we are currently working for the UN, trying to bring stability to the people of South Sudan. As an engineer I have been extremely busy with providing water (pumping straight from The Nile) which goes through a rigorous filtration process. Also I’ve had to re-build a part of a jetty which was due to collapse this is crucial to the locals cause this is where all the supplies come in from. I will stop boring you now, thanks again for the parcel, and I hope this letter finds you well. Take care !! PS forgot how good Irn Bru was!!!! My name is Kris ******* and I am currently serving as a sergeant with the Royal Air Force’s Signals Unit. I have deployed in command of a team of 9 communications specialists from RAF Leeming in North Yorkshire and on behalf of the whole team, I would like to thank you for the welfare boxes you have kindly sent us. They are very much appreciated. It was a nice surprise to see an address from home. Originally from Glenrothes in Fife, I regularly travel home with my wife and 3 young boys to see family. We often travel along with M9 and over the Kincardine Bridge which isn’t all that far from you. In fact, we had the kids at The Kelpies just a few months back and they had a great time. Your support to our troops is greatly welcome. The time spent away from family can be tough at times, but the little things raise morale such as a delivery of mail. Even more so, is the fact that members of the public are also thinking of us and are willing to spend a little time to send us gifts such as yours. I sincerely hope that this letter finds you well and that you are enjoying the summer back in Scotland. 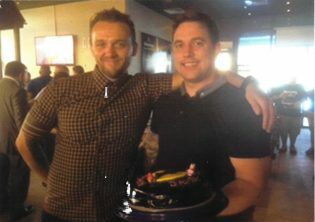 Again, on behalf of Dave, Gemma, Joe, Mike, Chris, Ricky, Tom and Matt we thank you for your support. Thank you very much for your very kind package. I distributed it amongst my company quartermaster sergeant’s (CQMS) team; they are logistic enablers who work very hard in the background to ensure all the lads have all the kit and equipment they need. 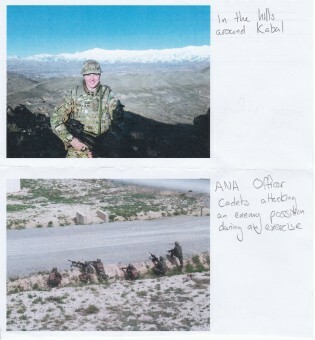 The men of C Coy I Royal Irish are based in a small camp just outside Kabul, on the western side of town. We are providing force protection (a bit like bodyguards)for a number of British, Australian, New Zealand and Danish mentors who are mentoring the staff at the Afghan national Army Officer Academy (ANAOA)The ANAOA is a very successful British project where we built an officer training facility based on the British Sandhurst model. It is probably the most successful training institution in Afghanistan providing approximately 700 highly sought after officers to the ANA each year. Whilst the mentoring of these Afghan instructors is what is making this such a success, the mentors could not do their job without my men, who stand for hours in the baking Afghan sun, looking for any hint of danger and ensuring the mentors safety. It is an absolute honour and a privilege to command these guys and is without doubt, the highlight of my career to date. Thank you very much for thinking of us all our here, your generosity is greatly appreciated. Throughout this deployment I have thoroughly enjoyed the packages that you and the kids have sent me and will forever be grateful for your kind kind hearted messages and Easter cards. I am sorry that I haven’t had the opportunity to reply until now. In the next few weeks I will be leaving theatre and will be heading home to spend quality time with my family. This means I will not receive your correspondence until it has been redirected to my next ship. I hope, however yourself and the kids are well and have a wonderful summer. Hopefully full of Irn Bru ha! ha! Thank you so much for the package you sent out to the C33 Troop, on behalf of all of us we greatly appreciate it. I don’t think many people know or realise just how morale boosting getting little parcels sent to us is. It’s a great feeling to know someone has gone out of their way to brighten our day so thank you again. We’re about 3 months into our 5 month tour and enjoying snacks from back home helps the time go by quicker. Incase you didn’t know, we are Royal Engineers from 22 Engineer Regt, Tidworth Garrison attached to 4 Scots to help fortify Al Asad air base as the Scots provide us with literally 24 hour protection daily. Once again from the Royal Engineers, family of ‘Sappers’, as we call ourselves, thank you may God bless you and take care. I hope you’re well and had a good Easter. Thank you for your packages which arrived safely to our camp in Kabul, Afghanistan. The messages and cards from the school children were well received as were the Easter eggs and treats. They were shared between the serving personnel here and were devoured very quickly! Thank you again for the work you do and your continued support. Firstly I would like to thank you for your generosity regarding the items you put in your SOS care package. It was greatly appreciated, especially the Irn Bru! One of the things I massively miss out here. I will make sure I find time to read the book too, it will be a nice chill out. As I write this, I am currently on duty however, I’ve saved the Irn Bru and the Irn Bru Wham bar to enjoy whilst watching the footy. I suppose it’s the little things ha! ha! Again, your efforts and kindness hasn’t went unnoticed, and I’m grateful. I am writing to thank you for your extremely generous Christmas parcel and to let you know where it ended up! I was given your parcel on Christmas day in my small base in Kabul. We took that day off work to give everybody a break. I am one of around 50 UK army personnel working with the Afghan national Army, trying to improve the training that they deliver to their officers. Once the officer cadets leave the officer academy, they may go straight to one of the provinces to join a unit fighting insurgents so we have an important job trying to ensure they are going to be competent members of their unit – from the first day they arrive there. I should have said that we are working with Australian, NZ and Danish army officers and soldiers – we all work as one team to mentor the instructors at the officer academy. It is a really fascinating job and one that almost all of us volunteered for. At Christmas, we enjoyed watching festive films together (“Elf” and “Die Hard” were the top rated films!) and sharing out boxes of nice food and cosmetics that people like you have been kind enough to send. It is greatly appreciated by everyone who works here at Camp Qargha – as it will be by all those deployed all over the world – especially at Christmas. I, personally, joined the army in 2002 and this is the third time I have deployed to Afghanistan. I very much like the Afghan people I have met so far – both in Kabul and out in the villages many miles from here in Helmand Province. I was originally a Scottish lass, born in Elgin, but I have spent the last 14 years moving around a lot so I’m now a bit of a hobo I suppose! Anyway, I do hope this finds you well and I’d like to say thanks again for your parcel. Many happy returns for 2017. Let me start with a massive thank you for my box! It is acts like this that restore my faith – after watching the news it can be easy to lose it. My name is ***** ****** I’m 27 and from Cornwall. I am a survival equipment engineer and currently based at RAF Brize Norton. I look after night vision devices, pilot helmets, life rafts, parachutes – anything that can save your life! I love my job and I’m very proud to be here. On my trade training course we had 2 Scotsmen, 1 paisley and 1 from Airdrie. The one from Airdrie thought he was much better and looked down on the other. As I’ve never been I couldn’t tell you. I’m sure you guys see this rivalry all the time! Thank you very much for the parcel I received it was greatly appreciated. You must of spent a lot of time organising and collecting items to make this a very successful effort which has made many individuals very happy to see how we are supported. In my parcel I also had contributions from the Stirling Protestant Boys Flute Band (who I have also written to)and the Reid family. My parcel contained a lot of lovely items, but it was the bottle of Irn Bru that made me smile the most as I am also Scottish being born in Dunoon. I am currently serving in the RAF on a 4 month tour on Op Shader. Thanks again for all your efforts. I hope you, your family and everyone who supported this contribution has a Merry Christmas and a Happy New Year. I would like to thank you for the Support Our Soldiers box you kindly sent prior to Christmas. It’s difficult being away from family especially at Christmas, however made much easier knowing people like yourself are supporting us. Many, many thanks for the very welcome Christmas gift box you were so kind to send out. I will certainly enjoy the sweets and chocolate in the weeks to come and the Santa hat, festive socks and beaker will all be well appreciated even after the day itself. Please can you pass on my thanks to the children of Blackridge and Bowhouse primary Schools? Their cards are a welcome and cheerful addition to my office. I enclose a picture of me (in the middle) with a couple of my colleagues about to open our boxes. Many thanks once again and I hope you have a great new year. Dear Lynn and your team from SOS Stirling. I would like to express my wholehearted thanks for the brilliant work you do. The soldiers of 3pl, Ops Coy have now started to receive their wonderful Christmas boxes. These have been a welcome treat to the young privates and kingsmen, some of whom are gearing up for their second (or even third!) Christmas away from home. For others this will be their first Christmas away from friends and family. As we approach the mid point of our 6 months in Nocosia it is uplifting to the soldiers morale to be reminded they continue to have the support of so many thoughtful, generous people back home. I have encouraged the soldiers to write to you themselves to show their gratitude and highlight to SOS just how universally well received their goodie boxes are. I will endeavour to get some photos and messages off the lads on Christmas day for your team to publicise. Thank you so much for the parcel I received this afternoon. Although the tour that we are currently deployed on is not life threatening, it must be said whilst being away from home at this time of year and receiving a good dose of morale was quite welcoming. We would just like to say thank you very much for the box you sent out. It provided some moral whilst we shared it around us. We all would like to wish you a Merry Christmas and a Happy New Year. I would like to take the time to thank you Mrs Lynn O’Brien and special thanks to Alisha, for the lovely box. Let me introduce myself, my name is Cpl **** I am from Fiji. I have three sisters and I am the p boy in the family. Mrs O’Brien and Alisha, I would like to say thanks once again for the lovely parcels and sweets, cards and games. We would like to wish you a Merry Christmas and prosperous new year. Alisha, thanks for the card and it’s on my wall now. Lynn, many thanks for your kind Christmas box that I received. Many thanks for the SOS parcel it was much appreciated and it certainly brightened myself and the lads up being out here away from friends and family. It gives us great comfort knowing that there are thoughtful members of the public who think about serving members of the armed forces abroad. I wanted to thank you for the parcels that you have sent me. They are very much appreciated, especially the Irn Bru. The Halloween package was great. The cards done by the kids in Denny Primary School were brilliant. I have put a photo of myself with my room decorated and the cards up. Not sure if you can or would show this to them and pass on my thanks. Just a quick note once again to say thank you so much for your latest consignment of 5 parcels. I did something a little different this time and made up boxes of things and put them in the accommodation blocks. They went very quickly, especially the Irn Bru. We have a company of Scottish soldiers providing out security at the moment so they were happy. I have only got 59 days left of a 13 month tour and am getting pretty weary from being away from home so much. Your parcels really cheer me up and I love sharing them with the troops. Lt Col ***** gave me his welfare box which was very kind. The dog section are very happy with the contents of your welfare parcel. My cocker spaniel Alvin in particular liked it. It’s great to have Irn Bru out here I haven’t had any for a long time being stationed in Germany. I am also from Scotland, The Orkney Islands. I have been out here for 3 months now and have had quite a good tour, I just have a month left now with the Ghurkas and then the Scots take over. I think it’s great so many people still support the troops out in Afghanistan. Alvin my dog is a vehicle search dog and we get used mainly down at the main entry point searching afghan vehicles on call. It’s not a bad job and working with dogs has it privilages. Thank you for a very kind gesture and it is very much appreciated by all of us working here. With the ASD (Ammunition Sub Depot) there is currently 14 personnel who will benefit from this parcel, it is good to know somebody who is back home supporting the armed forces when deployed on operations. 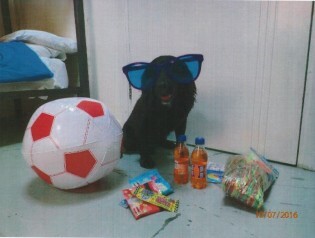 I would just like to thank you on behald of ASD section for the items you have sent out to the Falkland Islands for us. I would like to say a massive thank you for your kind gifts that you sent for me to open on Christmas day, it helped to make mine and the rest of the ships company Christmas day a lot happier. I am very grateful that their are people in our country like yourself, who think of all the armed forces personnel that are deployed on operations, away from their loved ones during the Christmas period. I would like to wish you a merry Christmas and a happy new year. Thanks again for supporting our armed forces it means a lot. Dear Mrs O’Brien and Denny Primary School Thank you very much for your kind parcel, we have just come back from a training exercise with the Afghan National Army and was a nice treat, especially the soap! My unit is based in Kabul which is the capital of Afghanistan. We are in a small camp to the west of the city. It is not just the British here, we have Australian, Kiwi and Danish soldiers here too. We work with the Afghan national Army Officers Academy which is one of the organisations that trains officers for the ANA. We are training the instructors here so that they can make the army better and help to secure the country. The work is going well and the Afghan instructors are conducting very good training with their recruits. Thank you again for your gifts. It is nice to know people at home are still thinking of us. I would just like to write to yourself and say a huge thank you for the box of goodies you sent out. I am Sgt **** and am currently serving an eight month tour in The Falklands. It is greatly appreciated to receive boxes of wonderful goodies from people like yourself, who don’t even know us, but out of the kindness of your heart you go out of your way to fill boxes of goodies and then send them to people serving in the forces. While being away from family and friends it is a great morale boost to receive these boxes and makes us feel appreciated. Kind regards and thank you very much. Dear Lynn, I just wanted to write to you and say thank you very much for the parcels you and SOS have sent to me. I have distributed them amongst the troops that work in the CAOC and the Irn Bru always puts big smiles on our Scottish contingent. I very much enjoy seeing them explain to the Americans and Aussies that Irn Bru is in fact Scottish water. I think a few of the Americans believe them! I recently came back from RnR and smuggled a couple of bottles of irn Bru and nice british bourbon biscuits but, as you can imagine, it all disappeared in the blink of an eye. Luckily your packages have all arrived today so we have a lot of happy soldiers. 4 months but to **** which will be a lot more welcome. There are a lot of very busy people here working long shifts with little or no mail and these packages have made that time a little more enjoyable and a sugar rush is always welcome. Thank you once again for your support and the lovely parcels. if you would like a new contact to post to Plt Off **** will be here for another 3 months. Please don’t feel obliged but it is really nice to receive the parcels and I got a lot of undeserved praise that is rightly yours when I distribute the goods. Dear Lynn I wanted to write you a short note to say thank you for all the care packages you are so generously sending out to us in Afghanistan. It really is incredibly generous of you and everybody here really does appreciate what you are doing. It’s really reassuring to know that people back home are supporting all that we are doing out here. Small reminders of this through your care packages do wonders for morale and help us to remember why we are here and who we are fighting to protect. Conditions at the base here are good. No one has anything to complain about although, of course, everyone misses their girlfriends/boyfriends/wives/husbands and families back home. I serve on a multi-cap badge team here in a multinational environment. Back home I am a recce officer serving with The Royal Dragoon Guards, based in Catterick, North Yorkshire. I am very much looking forward to getting back to my friends and family in ****** and, in my home town of ******, when I finish my time here. It’s not too far to go although I have only been here since early December. Thank you again for all you are doing to support the troops out here. Your packages really do mean a lot and are very much appreciated. We would just like to say a quick heartfelt thank you for the welfare packages that we received recently. To say that they went down a storm would be an understatement. They were hugely appreciated by all personnel serving here. Without many of the luxuries you sent available to us, they were a timely boost to morale at a time when the workload has never been higher. Your efforts make a huge difference to all of us and we thank you for everything you do to make that important difference. Dear Lynn I would like to take this opportunity to thank you Lynn for taking the time to send welfare parcels to Kabul for Christmas last year. I am ***** based in Redford Barracks in Edinburgh currently on operation in Kabul. I am working under 2 Scots but we are 5 Scots. We normally work every day depending if the mentor/advisors want a meeting with their Afghanistan counterparts. Sometimes we went out due to some circumstances on the streets of Kabul city. We really enjoyed our job and the boys look after each other well when working out there. Anyway thank you very much for the present and the box which made me feel that I was back home with my family. I want to wish you and your family a very best and successful life in the future. This is just a quick letter to say thanks very much for the kind parcels you sent out to Kabul. I have begun dishing them out to the boys and girls but they are under strict orders not to open them until the big day! I just wanted to say thank you for your Christmas parcel. I will apologise to start with for opening it too early, I am glad I did because I have already used the woolly hat out in the field. We had a few days on patrol on the outskirts of Kabul and it was really cold. I have also shared some of the chocolate. The parcels that you send out here for us really makes a difference. Yours in particular was given to me because there was no mail for me so the mail clerk, CPL ****, gave me your parcel to cheer me up – brilliant, chocolate, wooly hat, Christmas decorations and some cards that are now up in my room. I wish you and your family and everybody at home a very merry Christmas and a happy new year. Thank you so much for the SOS Christmas boxes you sent out for me and all of my collegues it is very much appreciated by us all. Dear Lynn, thank you so much for all the lovely parcels you have sent out to the ship. It is so nice for us to receive post, let alone so many kind gifts! We are now halfway through our 7 month deployment in the Gulf and people are starting to look forward to getting back to the UK. It is very hot here now and only getting hotter so I’m hoping for rain when we return!!! We are headed back up to Faslane when we’re back though so I think there will be plenty of rain to look forward to! So far on the deployment we have been to lots of interesting places including Qatar, Dubai and Abu Dhabi, it’s fascinating to see such different places as well as Bahrain where we are based and it certainly stops you from getting bored! We’ve also seen a lot of dolphins, turtles and sea snakes which is a bit different from the waters of Scotland! I hope that all is well with you and thank you again so much for your lovely parcels, the morale will be high on the ship now! 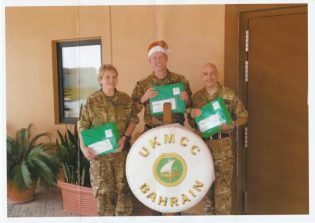 I am writing to say thank you so very much for your wonderful gesture in sending me a parcel whilst deployed on operation in the gulf over Christmas on RFA Fort Austin. I have been in the armed forces for 10 years and joined the Royal Navy when I was just 16 as an Operator Mechanic (Communications). I have been away over Christmas for the past few years away from my husband and receiving your lovely parcel really brought a smile to my face. I can’t begin to describe how grateful I am. I see you are from Scotland, my husband and I made the move to Scotland ourselves a couple of years ago as he is currently serving in the Royal navy as a Petty Officer (Marine Engineer) on HMS Queen Elizabeth, based in Rosyth. I would just like to say thanks again for your kindness it is truly appreciated and so thoughtful of you. I also hope you had a wonderful Christmas and hope that 2015 brings you lots of happiness. Hello, firstly I would like to say a very very big thank you for the Xmas present, it was wonderful to have something to open up on Xmas morning. My name is ***** and I’m 56 and I’m the COP D (Bosun) on board RFA Fort Austin, we are in the Gulf at the moment so no snow for us!! some sun though ha! ha! Hope that you had some snow?? I have been on here since the start of September and I will be due to go home at the end of January so not long to go now before I’m home again. **** and my two children are called **** & **** and let’s not forget Doodles the dog he is 4. I do miss them but we can phone and email each other when we like so it’s not too bad, yes they are proud of me and what I do and I am proud of them as well. I bet your mum and dad are proud of you for thinking of others at Xmas time. I hope that you had a really great Xmas and got all that you wished for as well, if you get this before the new hear “HAPPY NEW YEAR”. Have fun and look after yourself and once again thank you very much for the present and thinking of us all out here at Xmas time. – with edible treats and the welcome toiletries it means a lot that people are thinking of us when we are so far from home, our families and friends. You may appreciate knowing a little about what I do as a Royal Navy chaplain. Based here for three months I have been looking after sixteen different units working in the region, fulfilling a wide variety of roles. My rose is to provide pastoral and spiritual support, which includes befriending as many people as possible, providing a sounding board/listening service for people facing difficult challenges here or at home, conducting services, recording stories read by parents for small children at home. It’s been the most varied and interesting job in my 10 years in the RN. next week I am due to return home to my wife and five year old daughter. people without military experience or connections could not imagine the challenges that service families face when their loved one is deployed. It means a great deal to them when they hear that people like your good self are thinking about and supporting us in our operational role. Lynn, thank you again for your generosity. May God bless you and your family richly. All good wishes. To Lynn, thanks a lot for the Christmas box I received whilst at sea. Dear Lynn, I am writing to thank you for the Christmas box you sent. I am a Royal Marine Commando on a Royal Fleet Auxiliary ship. I am second in command of a ships protection team/boarding team. Our job is to protect this ship and board suspect pirate vessels. We were luckily along side in the UAE for Christmas and I managed to call my girlfriend and parents on the day. Your parcel was left outside my room in the night so I found it on Christmas morning, it was a very nice gift and I especially lied the custard creams. My 6 month tour is nearly finished out here, I will be back in the UK before the end of January. I am really looking forward to getting back because I have bought a house while I’ve been out here and I will be moving in when I get back. Thank you very much for the parcel again, it was a very nice thing for you to do and I hope you will do it next year for another person out on operations. To Lynn, thank you very much for my Christmas parcel it was very thoughtful of you. I hope you enjoyed your Christmas celebrations in Scotland, the only time I’ve been there is when I did my final exercise in basic training at Gairlochead and it was freezing!! but I bet it looks very festive in Scotland at December time. Here in Afghanistan it’s pretty cold at the moment (not like when we arrived when it was roasting!!) all the mountains are covered in snow, I’ve never seen mountains that big before, almost like the Himalayas!! I wore the hat you sent me to my Christmas dinner, which made a nice change from either wearing my helmet or beret! It was fantastic having a bottle of Irn Bru, they don’t have it here in Afghan so it made me feel at home. A big thank you for my Christmas box it was a wonderful gesture. Not a lot of people know that well over 90% of goods in and out of our country is moved by sea, hence the reason i’m at sea away from family at this time of the year. We have a busy task keeping the shipping lanes safe all year round so many of our ships are kept at sea on patrol all year. It is not my first time as I have had to spend Christmas many times at sea away from my wife and children but this year is quite different having received a parcel from a stranger who I have never met. I think it shows the good in people above the bad that is going on around the world, it makes us feel a bit special to continue the vital role we are making. Can I again thank you for the kind gesture and I appreciate the time and effort you have made to make someone’s Christmas away from home a little bit special. I hope you and your family have a merry Christmas and I would like to wish you a prosperous and a peaceful new year. Best wishes. This comes to wish you a very happy new year and every success in 2015. Thank you so very much for the box of Christmas gifts you sent out through SOS – the thoughtful selection of useful and tasty items was a real uplift for us on Christmas Eve. I serve as the Royal Nay Chaplain in support of RN personnel ashore and afloat in the region so your generous gift came at just the right time – after weeks of busy preparation and as we began our own celebration. On Christmas eve we had an informal carol service alongside in which personnel from two ships companies took part in humorous sketches with a Christian message before we opened our presents and had Christmas dinner. 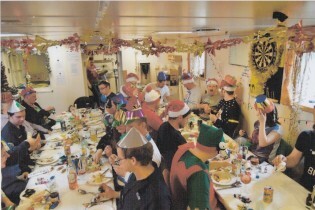 It’s an old naval tradition that the officers serve the ratings for Christmas dinner – we followed the tradition before sitting down to our own at the end of a very full day. Christmas has provided a welcome break from significant periods at sea in which we have been monitoring the military threat to regional security. Whilst the navy is rarely in the news for taking offensive action these days, much of our work is about monitoring, information and reassurance to our allies. In this area we work closely with colleagues from The United States Navy, and it’s been a particular pleasure to me to befriend their chaplains. My role here is to provide pastoral support for everyone going through personal difficulties, some of which relate to people at home (when distance from families makes resolution problematic) to befriend our sailors and provide a spiritual presence. Dear Lynn, thank you so much for the parcel and for organising the other ones we have written to the primary schools to thank them also. I am going home in 2 weeks time so will no longer be out here so I would just like to say thank you for taking the time and effort it really makes a huge difference and we all enjoy getting post and then having some extra goodies and treats. the female boxes also go down well amongst us girls! 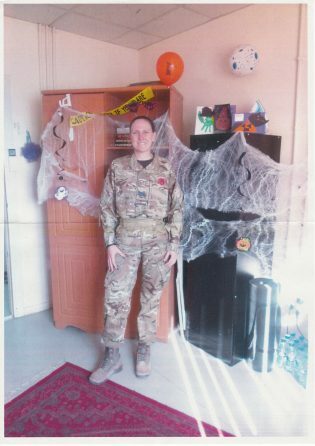 Mrs O’Brien many thanks for sending me parcels while I have been in Afghanistan, they have been very much appreciated, thank you for your thoughtful packages. I would like to send my thanks for the welfare packages we received from yourself. Decent toiletries and sweets are a luxury whilst working in such a harsh environment. It gives me great comfort that people like yourself in the UK are thinking of our service and giving us their support. Dear Lynn, my name is *** I am operating department practitioner currently working in theatre at the hospital in Camp Bastion. The parcels were very nice I visited welfare to make sure everyone who needed comfort items got them. Life out here is ticking by well, it is 38°C at the moment very very hot and getting hotter. Have to admit I struggle with heat, I am from Yorkshire and I am a snow person! I am in the army snowboarding team and I can’t wait to get back out there. Hope life in the UK is good, hopefully the weather is picking up, I hope you all have a brilliant summer. Thank you again for thinking about the people that are out here, nice to know the forces are thought about back home. Once again thank you very much for the welfare packages you sent. I tried to divide them equally amongst the varied sections it did, however, turn into a bit of a bun fight!! Boys will be boys. We received a parcel with a letter from a cadet Robinson we have written back however the address was pretty vague. I am just writing to thank you for your very generous box of goodies. I am the only female in the Battalion so it is lovely to receive some girly things from time to time. Life is quite pleasant here really, the camp is small but well established and I get to get out and about a lot. The city is amazing in some ways Kabul could be the most beautiful place if you look beyond the pollution, dirt and grime. From pictures taken in the 1960’s you can hardly believe it is the same place. I am confident it can return to those days. I am involved in monitoring the progress of the elections and it is amazing how organised and robust the process is going. I shared the box with some of the boys and they guessed straight away thai it came from Scotland by the contents! I gave the Irn Bru to my Danish counterparts but have yet to gauge his reaction. As much as I lit it I think it is an acquired taste! Thank you for thinking of us out here, we are all very grateful. Dear Lynn, I would just like to take this opportunity to show you our sincere gratitude for your kindness and thoughts. The contents of your parcels have been shared out amongst our team and consumed with enthusiasm! So it is with warm wishes and full mouths that we send you a big thank you from Gareth, Jonathan, Kyle, Keith and Ben … thanks for the Irn Bru! Dear Lynn, My name is ***** and I am writing to say thank you for the batch of parcels you sent for me and the lads here in Afghanistan. It is always a good boost to morale and I was pleasantly surprised to find a taste of home when I say the Irn Bru. The draw down here is going well as this place gets smaller by the day. Luckily for me though my boss is sending me home early and I will soon be back with my family, most of the other guys are not so fortunate and must stay for another few months. Dear Lynn, I hope this letter finds you well, I am writing on behalf of Theatre Equipment Support Group (2 Combat Support Battalion Royal Electronic mechanical Engineers) for the generous hospitality you have shown by sending our boys and girls parcels full of goodies on a regular basis receiving mail whether it be a letter or a parcel lifts the moral of our troops. My role within Theatre Equipment Support group is the deployed Chief Clerk, predominantly, my area of expertise covers all G1 aspects which range from pay, welfare, education and providing staff support to the Commanding officer. The area I most find enjoyable is ensuring that the soldiers receive letters/parcels from loved ones and of course kind hearted people such as yourself. The majority of Theatre Equipment Support Group personnel are located in Camp Bastion 1, we have a number deployed in forward bases. the forward areas have basic amenities and are austere, yet still a major improvement since my previous tour on Op Herrick 8 in 2008. It is very reassuring that the general public are supporting the troops, I am currently on my seventh tour of duty, from personal experience having served here over 5 years ago I can definitely notice that the campaign is moving in the right direction. In time we as a nation can be proud of our efforts in training, mentoring the Afghan national Security force and stabilising a country. I hope that the local population can thrive in the infrastructure we have provided and make this country a better and more stable place to live in. Please accept my gratitude on behalf of the soldiers, I thank you for your continued support. Dear Lynn though I’d let you know your parcels got here and how grateful I was for the grass skirts and the popcorn a real morale lift! Hello Lynn, let me start by saying a big thank you for the parcels. Great bit of morale for myself and the lads over here. Thank you for the delicious treats you sent to us. We’ve enjoyed them very much! The Easter cards are on show in our staff room as well. Lcpl *** has gone home now so we have shared everything around the rest of the theatre team. I can’t explain just how good for morale these parcels are, it’s lovely to know people are thinking of us back home. We’ve nearly finished our tour of duty now and are very much looking forward to going home and seeing our loved ones. Thanks again for your generosity on behalf of Herrick 19B Operating Theatre team. I would like to say thank you for the “Support Our Soldiers” box that I received from yourself. I am currently serving with 51 Squadron RAF Regiment which is based, normally, at RAF Lossiemouth. Your box was one of many that was sent to one of my colleagues who then distributed them throughout the squadron. Parcels and letters are I believe the main thing that servicemen and women look forward to on a daily basis. This is even more important when we are deployed over the festive period. Once again thank you for the box it was very much appreciated by myself and everyone else that received one. Thank you so much for the parcel you sent today it was full of things I like so thank you. I shared it amongst all the lads so you made them very happy. I see on the news of the devastating floods the UK have been having to put up with, glad you are not effected. I see they have the forces to help out which is good however, they still are making some of us redundant which isn’t so good. Glad to see you had quite a nice Xmas, we too didn’t do much other than work the war doesn’t stop for Xmas I’m afraid although they seemed (bad guys) to be very quiet. The weather here is picking up and has started to get warmer which is nice, I don’t like the cold as being so slim as I am my bones really do feel it! Anyway I’m so looking forward to my well deserved RnR I can’t wait really need some sleep and rest for my body and mind is constantly tired. My husband has been keeping himself busy whilst I’ve been away which is good as I do worry about him. Thank you so much for the parcel I received today, it was full of goodies which were all eaten in a couple of hours by all those that work with and around me. The weather has turned awful here, it’s raining constantly maybe it’s been brought over from the UK lol How is the weather there? Are people starting to get their lives back in order? Hope so. What we were seeing on the TV was not good news. Well, I’ll soon be packing my bags to go on RnR for 2 weeks leave to Germany and I can’t wait. My body and mind is running on reserves, I’m constantly tired and it’s showing when I look in the mirror in the morning. I’ve also got grey hair since being here (not good) It’s constant work, long hours. Too much work and not enough hours to do it but we will soon be going home so not long now when we can all relax and enjoy our 8 weeks of leave. I can’t wait. It’s nice to know I have genuine people such as yourself who care. I think you are wonderful doing what you do sending parcels to the troops and I hope one day we can repay you for your kindness. Hope to hear from you soon, in the meantime look after yourself. As you will see from the sender address this is not ***** ****** that is thanking you for the box of ‘goodies’ that you so kindly sent! The girls on the selection are putting them to good use as **** has now finished her tour. My tour comes to an end soon and I will be returning home, not far from you! My role here is as a flight medic and I worked with **** a few times before her tour ended. Taking the sick and injured by air to the various medical facilities around Afghanistan. The toothbrushes you sent were shared out across the whole team (guys and gals!). Everyone loves when the mail arrives! 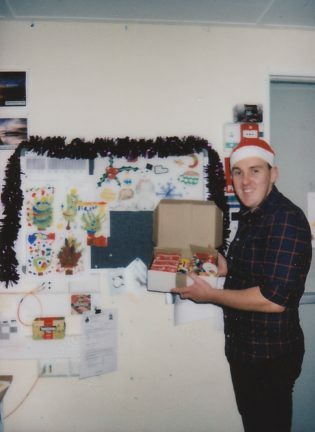 On behalf of my ships company I would like to write to thank you personally for the Christmas boxes that you and your colleagues sent to the ship. On Christmas day it is a particularly nice surprise to open a parcel, and it gives the ship a feeling that someone other than our families are thinking about us and what we are doing. The very nature of our business at sea, is such that it is often out of sight and therefore out of mind to many, and the knowledge that people do take an interest in the work we do around the globe is most encouraging to both me and the ships company. RFA FORT VICTORIA has now returned back to the UK after three years deployed to the Middle East, where she has been exceptionally busy undertaking primarily anti piracy activities. As I write the ship is undergoing a multi million pound refit to upgrade and refresh systems so that she is better able to deliver the kind of service that the Royal Navy and our collation partners require. It is anticipated that the ship will return to service in early 2015. Please pass on my heartfelt thanks to those other families who were involved in making the boxes. Dear Cubs, My name is Anna and I have been a nurse in the Royal Air Force (RAF) for 5 years. I have been in Afghan since September, I am due to go home at the start of January. This is my second time in Afghan. I was last here in 2010. When I am in Afghan I work in a team of ten people, 5 nurses and 5 medics. We fly patients from Camp Bastion to other hospitals. If the patient is from Afghanistan we fly them mostly to Kabul on an aircraft called a Hercules. If the patient is from the UK we fly them to RAF Brize Norton on a Tristar or a big aircraft called a C17. The C17 is so big it can fit a fire engine in it. Our work place was recently on TV when Gary Barlow visited Afghan, he came and met a flight medic who sang with him in the concert. Although your parcels were addressed to two other people I was provided with them as I think the named people had left Afghan. I was very excited to receive the parcels. I took them to my work place and placed them under the tree for me and my friend Kim. We were very good and waited until Christmas day to open our presents. Kim and I have been friends for a few years so it is nice to be in Afghan at the same time. We are both based in Peterborough and we are both from Liverpool. Kim was very happy with her parcel, she received some lovely socks which she says she will wear at night time. It has started to get chilly of a night time, so socks are great. Kim also loved the fruit as we don’t get little tins like that over here. Kim said the best bit of her parcel was a card that had been made for her by G*****. She was very impressed by the handwriting which was very neat and the lovely things that were written. I think I was spoilt with my parcel, I also received fruit and lots of lovely sweets. It is always lovely to receive treats, but it’s extra special to receive a girls treat as it allows me to feel a little bit girly again. That’s why I was so happy when I saw that I had been sent a lovely toiletry bag. I can’t wait to use it for some of my lotions. I was given an extra surprise when I opened the bag to find a lovely pair of white sunglasses. Today we have had a lovely day, we have all relaxed, which is a treat. We are just watching Finding New and later I will phone my family. Your parcels were a lovely treat and we really appreciate the time and effort that you have taken in choosing such lovely gifts and then sending them to us. I am sure that such caring and unselfish children would have been given lots of special presents from Santa. I hope that you all had a lovely Christmas and that you all have a wonderful new year that is filled with lots of laughter and lots of lovely memories. Sometimes it is hard to be away from home, especially at Christmas time, but I want you all to know that your boxes made a huge difference. Thank you so much. Dear Lynn, thank you very much for your box it arrived on the day of our Burns night supper so was definitely appropriately timed. We shared it our amongst the Ops room and the girls definitely appreciated the fudge and shortbread! The hoodie has also come in very useful as the evenings are pretty cold here despite the warm weather in the day. Thank you for taking the time to send the parcel, it is really nice to know that people back home are thinking of us being away I know I can speak for the whole of my team when I say this. Many thanks again and kind regards. Dear Lynn, hope all is well, thank you so much for the parcels today filled with Weetabix, chocolate (a woman’s favourite snack) and useful poems, it’s always nice to open parcels I love it. I have shared the contents with some of the other members of the battalion so thank you. I see on Sky news that the Army have been called to help assist with the floods. It’s nice to know that the troops back home are still working as hard as those away in theatre. Things here are still very much the same, the weather is picking up though! Keeping safe and hoping the days pass quick before I set home for my well deserved R&R in ****. Well, take care, keep in touch and once again Thank you. Dear Lynn, I received a batch of parcels from you today. The girls and guys really enjoyed your boxes, especially the hoodies. Thank you so much for your kindness. I hope you had a lovely Christmas and a great Hogmanay! I see you live in Stirlingshire, I normally go up to Stirling Castle for the New Year, although it’s so cold, I just love it. Live music, everyone enjoying themselves and in the few years I’ve been I have never seen any fights or trouble so it is always a good night. We are now into our 4th month of this tour, it’s gone by pretty quickly to be honest, hopefully the next 4 will go by as quick and home in time for summer! I hope you are well and thank you again for the parcels, you have made 6 of my soldiers very happy today. Thank you for that too. Look after yourself, in friendship. Hello Lynn, I received a welfare box from yourself from SOS and I would like to thank you for your generosity. THANK YOU! It was lovely and I enjoyed eating the sweets. I hope you had a lovely Christmas and a Happy new Year. I was away at work for Christmas but I was a lucky one and managed to have my RnR all over the New Year. Thank you again what you do is a lovely, caring thing. All the best. Dear Lynn, I would like to wish you a belated happy Christmas and New Year and thank you very much indeed for your parcel that I received on Christmas day from Support Our Soldiers. Although I am not currently based in Afghanistan, I have previous experience of spending the festive period on various operations worldwide, including Op Herrick. I am part of a unit stationed in the middle east directly supporting our troops on the ground on Op Herrick. We were all very humbled to receive the parcels and even more grateful for their contents! Even though a large part of life here is a lot of physical training, the edible items were more than welcome! Picture if you can, dozens of “grown ups” shrieking and laughing at the items in their boxes – in my case a pair of Y fronts – even more so because they fit me! Being away from home always has it’s issues, in my case I have 2 children who I miss and they miss me greatly – to have a card, drawn by Matthew and another my Liam was a nice touch. As with all the service men and women in the armed forces – I feel a tremendous amount of pride in what I do for my country and to receive the support that people like yourself give to us is very humbling and makes us even more determined to get the job done. Many, many thanks and please tell your friends to do the same! Kindest regards. Dear Lynn, Freddie and Scarlett, thank you very much for my surprise Christmas box, it was absolutely lovely and gave me some Christmas cheer. I am really looking forward to having hot chocolate when it gets colder. I love the scarf and the wash bag too, it’s always good to have some luxuries. I hope you all had a lovely Christmas day and ate lots of festive food. The chefs here did us a lovely Christmas spread with a choice of beef wellington or turkey and then Christmas pudding or yule log followed by Christmas cake. We had a Christmas quiz and cards too so lots to keep us entertained. Thank you for my wonderful Christmas cards they were so sweet, they made me smile. From the cards I am presuming that my box is part of a school box collection, please thank everyone that took part. it’s not anyone’s dream Christmas to be away from their families at this special time of year, but it is really heart-warming to know there are generous people at home who go to the trouble of gathering these lovely things to give to a stranger. My gifts certainly brought a smile to my face on Christmas day. I hope you all had a lovely Christmas day with your families and friends, being away certainly makes you realise how special they are. I wish you all the best, health, happiness and luck for the new year. thank you once again for brightening up my Christmas day. Hello Lynn, firstly, I hope you had a great Christmas and Happy New Year. I apologise for the amount of time it has taken me to reply and hope it has not put you off sending another parcel in the future. Unfortunately, the holiday period here has been busy as a lot of servicemen, especially those who are married and have children, want to get back home to see their families as you can imagine. I would like to say a massive thank you to both you and Anne and the 2nd Montrose Cubs group, I am very grateful that you have taken the time and effort in order to send me a Christmas box. I hope everyone at the 2nd Montrose Cubs group had a great Christmas and that everyone got everything they wanted for Christmas. I wish you all a Happy New Year and thank you all for doing good turns for your family, friends and neighbours so that I could have a fabulous Christmas box. I also want to say a big thank you to Glenn for your letter and picture. I’d have to say that chocolate is probably my favourite food also though I’m trying to eat less this year. I also want to say as a reserve soldier from Birmingham how grateful I am that someone as far away as Stirlingshire has taken the time to send me a parcel. I am very grateful to you and many other Scottish people for sending me so many lovely items. I feel quite indebted to the Scottish people as in 2011 I was deployed with 4 Scots in Babaji in a check point with very few facilities and even less welfare, it was only due to the generosity of people such as yourself that many received any welfare parcels and so you will always occupy a warm place in our affections. I hope to write to you again soon, later today I will/Facebook Anne and hopefully send a few photos of me and my work colleagues for you to show the beavers and cub scouts. Dear Lynn, today I found myself talking about you to a friend, I was explaining how I wrote back to you after receiving a parcel and how you were kind enough to take time out to write back. Then to my surprise, someone mentioned I had a parcel and when I checked it was from you! Thank you for keeping me in your thoughts. The parcel was amazing, I came out with one hoody so I swap between that and my softie jacket, it’s perfect. I’m glad your son is recovering, the other night the IDF alarm went off, kind of reminds you that the danger is still out there even though we are here just trying to help. I know I don’t know him but could you wish him all the best in his recovery. We do 12 hr shifts, if we are lucky and don’t have to work extra hours, then I try to get training in and time on Skype to talk to my son and husband. My son is 3 and I miss him so much, I haven’t been away from him this long before and I can’t wait to give him a big hug when I return back home. Once again, thank you for keeping me in your thoughts, I have already made a start on the little book of poems, it’s beautiful thank you. I am Cpl R** from Afghanistan again. I am writing this to thank you and your team for doing so good job yet again. I have just received the badminton equipment and writing this yet again to give you a very big thank you. The person who received the equipment could not locate me as this is a very big Camp. We are making the most of the equipment and really enjoying a fun game of the badminton. Once again thank you very much. We have been deployed since last September and now based in Camp Leatherneck within Camp Bastion and we are doing our job well. It is getting colder here in Afghanistan these days so as in the UK, I guess. We are very proud to be deployed and serving for the country. As some say ‘good things come in small packages’, your gifts with full of appreciation and wishes are boosting our morale even in this battlefield. As the Christmas day is knocking at the door I would like to request for few small toys for x 9 boys in my group only if it is possible. It is just to bring more smiles in their faces. Your kind help and dedication for the soldiers is very much appreciated. Dear Lynn, thank you very much for your parcel which I received on Christmas Day. It was thoughtfully put together and brought a smile to my face. I will really enjoy all the contents which are very much appreciated. Today I received a parcel from you. Thank you very much, I have put up the decorations you included and really like the Christmas cards from Liam McDonald and Ryan Milne. Although this is my 4th tour of Afghanistan it is my first when I have been away over Christmas. Getting parcels like this really does make a difference, many thanks. Have a great Christmas and a Happy New year. I am part of a team of 7 doing seven and a half months out here. We will still be here for Christmas, but we don’t mind too much as we have loads of sweets, good food and we get a day off to watch Christmas films. Many thanks again, have a great Christmas and a Happy New Year. Dear Lynn, I hope this letter finds you and your family well and I would like to say thank you for the parcel I received today. Life out here can be a bit dull and boring so getting a parcel is a huge morale boost and makes you feel like a kid again and it is also good to know people are thinking about us at this time of year and to think complete strangers can motivate themselves to buy goods and send them out is a good feeling. I know the other guys who got parcels from you feel the same. I will write to the Air Cadets and Denny Primary School also to say thank you for the handmade cards, nearly brought a tear to my eye! It’s also refreshing to see the parcel come from B********* as I live just up the road in T*******. You will probably get this letter after Christmas but just in case I hope you and your family have a wonderful Christmas and New Year. Dear Lynn, thank you for the time, thought and effort in which you have put in to helping us enjoy Christmas. I received a parcel today and look forward to opening it Christmas Day. Just wanted to show my appreciation and I hope you know just how much it means to me/us out here to know people back in the UK are thinking about us. I hope you have a very Merry Christmas and a Happy new Year. 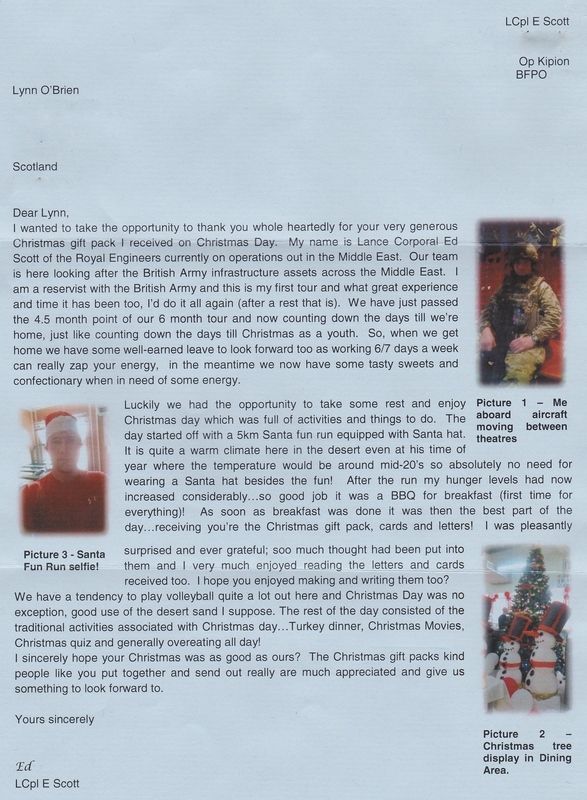 To Lynn, just a small note to say thank you very much for the boxes you sent out to us in Afghanistan. It means a lot to us to know that people take their time to do something so generous, it certainly brightened up our day. We were at work but we all tried to be upbeat and festive. We had our Christmas jumpers, hats and Christmas music. It actually wasn’t too bad, not home, but not too bad. We did a secret Santa which caused a few laughs. our Christmas dinner wasn’t half bad either although a glass of wine would have helped it along. Not to worry only * weeks left then we can have a glass. Home straight now, looking forward to getting home. Anyway I hope you had a brilliant Christmas and new Year and thanks again for the gifts. Dear Lynn I just wanted to drop you a quick line to thank you for the parcel you sent out to us guys here in Afghanistan. It really means a lot to us out here and is a great morale booster. Your package ended up at Lashka Gar where we are helping to train the Afghan police. Yet again thank you for taking the time to send the parcel. May we offer our sincere thanks for an outstanding batch of welfare boxes. They have been suitably disbursed and hopefully some others have taken the opportunity to pass on their personal thanks. We are settling well here and getting into a routine which is good news and the hot weather is starting to recede a little which is even better news for a fairly over constructed Scot who doesn’t do the sun well. Many thanks for your wonderful parcels of morale and every blessing to you and yours.